The other evening, I attended an Open House at Vaneli’s Handcrafted Coffees as part of Sacramento Specialty Coffee Week where home brewing methods were demonstrated, an espresso bar offered every variety of coffee drink, and cupping was featured in the roasting room. 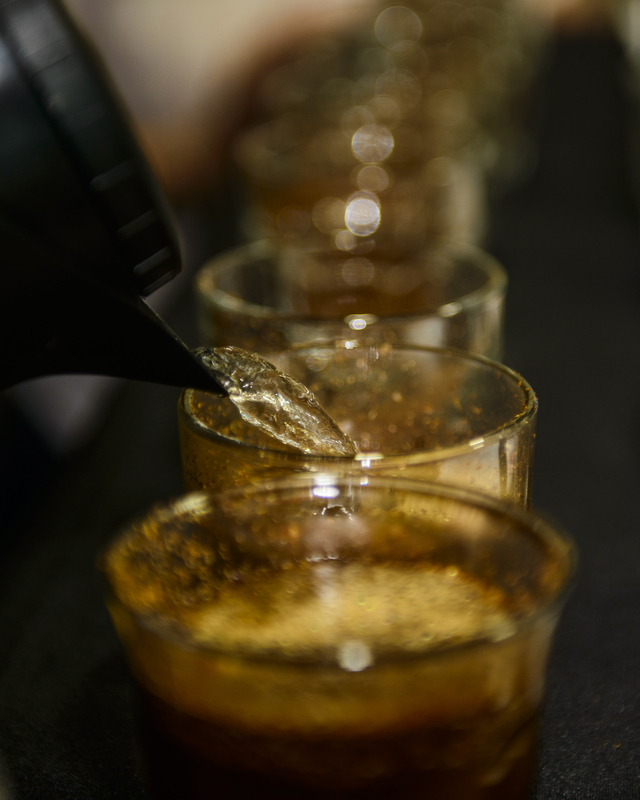 Cupping is the process developed in the coffee world to critically analyze coffees. Roasted coffee beans are ground and placed in a glass cup which is then filled with hot water and left to set for a minute, after which the surface crust of ground coffee and foam is pushed aside and coffee is spooned out, tasted, and flavors are analyzed. This shot shows water being poured into the cups with ground coffee. I liked the abstractness of this shot. This entry was posted on October 21, 2015 by Carol Smith. It was filed under Uncategorized .